Madingley Hall. Altered 1871; extensively reconstructed by J. A. Gotch, 1906-10. Madingley, near Cambridge. 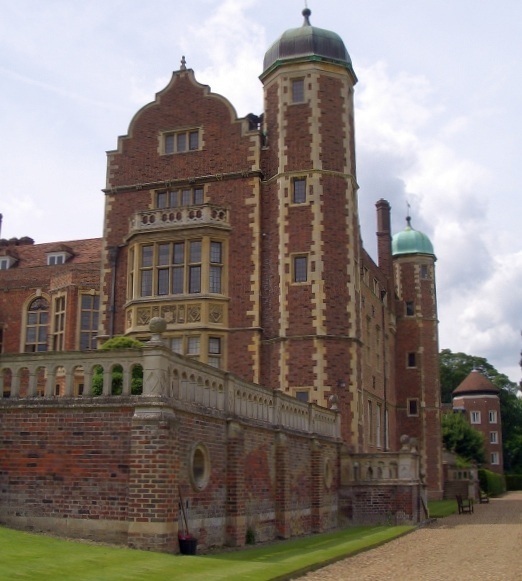 Built in the sixteenth-century, Madingley Hall was for many years the home of the Hinde (or Hynde) Cotton family. In 1860, a few years after Lady Cotton's death, it was lent to the royal family for use by the Prince of Wales while he was studying at Cambridge. Edward was visited there by his father Prince Albert, who apparently scolded him for not applying himself. In 1871 a new drawing room was put in by the subsequent owner, and in 1906 work was started on a large-scale restoration and reconstruction to designs by the Northamptonshire-born architect/architectural historian John Alfred Gotch (1852-1942), brother of the artist Thomas Cooper Gotch. J. A. Gotch had studied at the University of Zurich and at King's College London, and had already achieved eminence, having been president of the Architectural Association from 1886-7; he was also a long-serving member of the council of RIBA (the Royal Association of British Architects). He had published several books on architecture, including a two-volume Architecture of the Renaissance in England (1891). Gotch later became the president of RIBA, the first architect from outside London to take that position. If he seems less well-known than all this suggests, it may be because his specialist knowledge of Renaissance architecture left him "no sympathy with modern trends in design" and made him "happier restoring old buildings than in designing new ones" (MacAlister and Elliott). Perhaps this was unfortunate, both for his long-term legacy and that of the houses on which he worked. 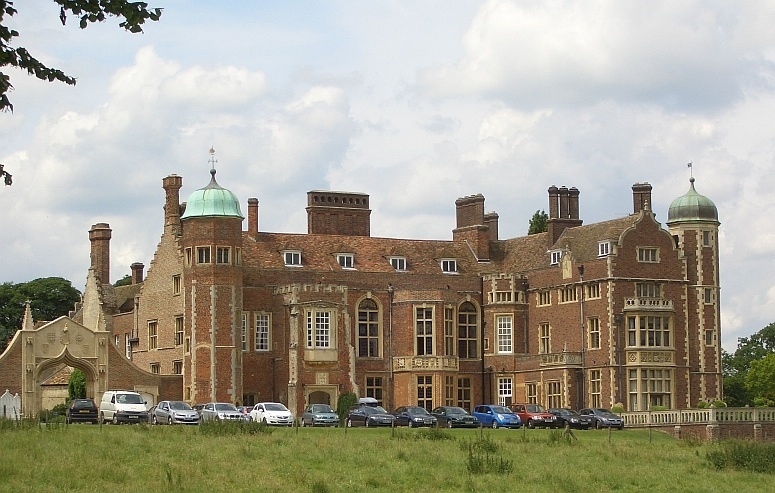 For example, Nikolaus Pevsner considers that Madingley Hall would have been the best country house in the Elizabethan and Jacobean style in Cambridgeshire, "if it had not been so much pulled about" (280-81). Be that as it may, the Hall is still an impressive sight. It now houses the Institute of Continuing Education, and provides accommodation for students and visiting scholars. MacAlister, Ian, rev. John Elliott. "Gotch, John Alfred (1852-1942)." The Oxford Dictionary of National Biography Online ed. Viewed 8 July 2008. Wright, A. P.M. and C. P. Lewis, eds. 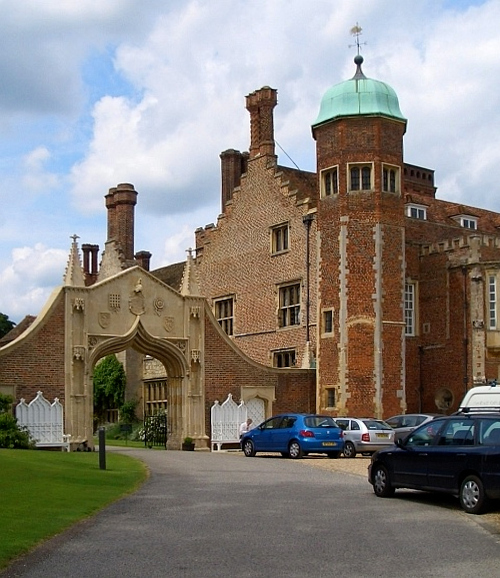 "Madingley: Manors and Other Estates." A History of the County of Cambridge and the Isle of Ely. Vol. 9. Viewed 8 July 2008.